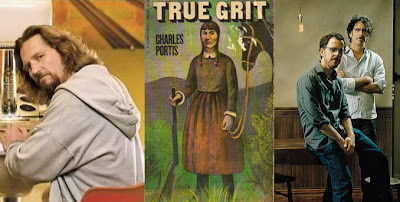 True Grit written by Charles Portis was originally a 1968 serial printed in the bi-monthly magazine, The Saturday Evening Post. In 1969 it was published in book form. The story followed a 14 year-old girl Mattie in 1873 who after learning that her father was murdered and local law enforcement are doing nothing to find the killer, she sets out to track down the killer. The young girl searches out the toughest deputy she can find and persuades him to help her find her father's killer and bring him to justice. Along the way, Mattie and Reuben J. “Rooster” Cogburn come across a Texas Ranger named La Boeuf, who is also hunting the very same killer and the trio set out intending to track down the killer who has taken refuge in Native American territory and is grouped up with an infamous outlaw gang. In 1969, Henry Hathaway directed the movie version of Portis's book which ended up winning John Wayne an Academy Award in 1970 for Best Actor. The 1969 version of True Grit focused moreso on Wayne's character Rooster Cogburn than the young girl Mattie and the Coen's new version will change that. The Coen's intend to make a more traditional vision of Charles Portis original serial. Joel Coen told the Daily Mail back in February, "The book recounts the girl's story. In the John Wayne film, she was played older. We want her to be her real age - it's her story!"